This is the story of Katniss Everdeen and Peeta Mellark. Katniss has lost her father in a mining accident and her family are desperately poor until she starts hunting illegally in the surrounding woods. Peeta’s situation is better as he is the son of the baker. Both live in district twelve. They live in a world where the population of the Capitol live in riches and those in the twelve districts live on the breadline. It is the districts that keep the Capitol supplied with all their needs. Each year two children from each district, aged twelve to eighteen, become the contestants in the Hunger Games, which is a contest, that ends when there is only one survivor. Who will survive? How will they survive and will they be able to live with the fact that they are a killer? The reader is encouraged to think what kind of society would use children to fight to the death and what type of people are living in the Capitol, who see the Hunger Games as a form of entertainment? This book is the first in a trilogy and all three books are available to read now, so there’s no waiting for the next book. My edition is published by Scholastic Children’s books. Whether they are suitable for children is a matter of opinion. As the story involves children dying I would lean towards an older reader. 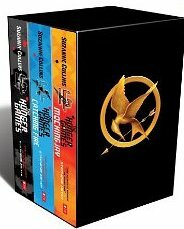 The Hunger Games, Catching Fire and Mockingjay are well written books and once started you’ll want to finish the trilogy. I hope you enjoy reading them and do let me know what you think. I’ve just ordered the film from Amazon and will let you know how it compares to the books.